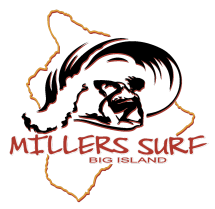 With the biggest selection on the Big Island, Miller’s Surf and Sport is your one-stop-shop for ocean sport gear rentals. All gear can be rented by the day or by the week. We have the best prices for performance bodyboards, NSP and South Pointe surfboards, and snorkel gear! We only rent out the best quality products - new or used - so that you can have a safe and fun experience. We have gear that suits everyone - beginner to experienced, child to adult! We also rent out additional gear like adjustable fins, life belts or vests, chairs, umbrellas, and coolers! We can even provide roof-racks for your car if you need a way to transport surfboards! If you are up for a great day at the beach, we can provide you with all of the tools you need to make it a memorable adventure! If you rent a piece of gear and fall in love, let us know as we have many items in-store that are for purchase as well! The Big Island of Hawaii has so much to offer for those who are seeking great surf, beautiful reef, and tropical sun - and now you can enjoy it with ease! Have questions about gear rentals? We are open daily from 8:30 am to 6:00 pm, stop by and see what we are all about. Or give us a call at 808-326-1771.